The requirements for a restaurant HVAC far exceed those of a typical non-food prep commercial building. A traditional HVAC system utilizes a two-part process. To put it simply, the system pulls in outdoor air into the building through a make-up air unit. The air is then conditioned by a separate heating and cooling unit. Because of a large amount of outdoor air necessary to replace exhaust air, ventilation and cooling this way are neither efficient or effective. Over Designed Systems: While it may seem like more is better, in reality, it can lead to higher energy costs and increased waste. Insufficient Make-up Air: The presence of either too little or too much make-up air to provide appropriate capture and containment. Misplaced Hoods: Hoods not properly located will result in improper ventilation and circulation. Improper Ductwork: If your ducts are not properly sealed or are constructed of less than required steel gage, the pressure will be off and inefficient. Inadequate Combustible Clearance: All of your equipment must have sufficient clearance from cooking ranges and fryers, etc. This is safety basics 101, but it is surprising how little some know about these standards. Having proper ventilation in a restaurant is imperative. It affects the health and safety of your employees and customers, plus influencing your food sanitation standards. Also, something as simple excessive unpleasant odors or stuffy indoor air can be a turn-off to customers. 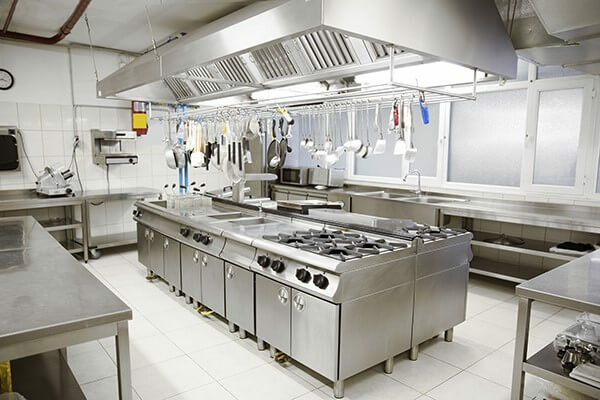 And, going a step further, studies have shown that higher kitchen temperatures result in decreased productivity.There is five zones of concern for a restaurant. The kitchen, dining room, restroom, lobby and outdoor dining. Make-up Air: There must be sufficient amounts of air exchange between indoors and out. Too much or too little will cause drafts and slamming doors, terrible air quality, reduced energy efficiency, and back-venting of combustion gases. Cooling: Something as simple as inconsistent temperatures can cause a decrease in profits due to customer unease, reduced staff productivity, and extremely high energy costs. Make sure to address all zones, both internally and externally when designing your system. Air Quality: Cooking will release gases, grease and smoke, all of which are not only unpleasant but can be dangerous. When designing the kitchen take into account placement of appliances, hoods, vents and exhaust fans. Try to coordinate this to increase HVAC efficiency, thus improving air quality. Fire Prevention/Suspension: City, county or state building code requirements may dictate your fire suppression systems. These systems may utilize inert gas, or dry chemicals to put out any fires that may occur. To help prevent fires make sure to maintain your system with routine cleaning and professional inspections. If you have concerns with your restaurant’s current HVAC and ventilation system or are building a restaurant and need a custom designed system, contact The Severn Group. Our knowledgeable technicians are skilled and experienced in designing, inspecting, maintaining and repairing commercial HVAC systems.